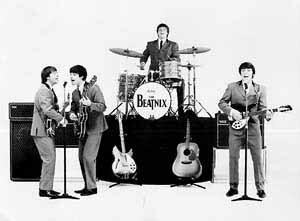 THE BEATNIX - THE BEATLES SHOW is at Club Phoenix on June 12. It is a show not to be missed by Beatles fans. Conceived in the early '80s, THE BEATNIX capture the excitement and atmosphere of THE BEATLES early concerts in the first half of the show. Dressed in typical early '60s attire, the band features songs such as TWIST AND SHOUT, I WANT TO HOLD YOUR HAND and SHE LOVES YOU. The second part of the show sees an impressive change of colour and mood set by the legendary SGT. PEPPERS LONELY HEARTS CLUB BAND military style uniforms and is composed of songs from the most significant album in modern music history.